Are Extracurricular Activities Important for College? Today, prospective students are required to provide a lot of information on a college application. Along with their personal data, students include information about their high school GPA, SAT score, ACT score, and any honours they’ve earned. Most colleges also want to learn about a student’s extracurricular activities. Students must make a list of clubs, sports teams, and volunteer and community activities that they have taken part in. Students who are making note of all of their activities may ask themselves, “Are extracurricular activities important for college?” Take a look at why it’s important to include extracurricular activities on a college application. Take this example: A student writes on her college application that she is a member of the young entrepreneurs club at her high school. She explains that she led a group of four students in creating several successful marketing strategies for a new fashion accessory sold to students at her school. When a college admissions officer sees this information on her application, they will note this student’s strong leadership skills. A student who takes on the responsibility of being a leader in a group is seen as an appealing applicant for admittance to a college. High school students may want to keep this in mind as they think of extracurriculars for college applications. 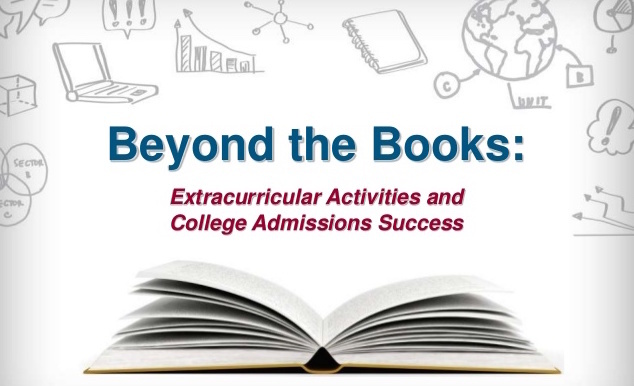 A college admissions officer looks at the variety of extracurricular activities on a student’s application as well as the amount of activities. For instance, a high school student may list that he is in the Math club, plays the guitar in the school band, works as a set designer in drama club, volunteers as a teacher in an underprivileged school, and spends his summers doing an internship. When a student participates in a wide variety of activities, it shows that the student is willing to try new things and has a broad range of interests. Not surprisingly, admissions officers want the most promising students to attend their college. On the activities page of the admission application, Student A says that he was a member of the art club, and in the description says that the club is for students who are passionate about having a career involving art. He also volunteered once a month, teaching a one-hour art class at his school. Student B is also in the art club at her school. In the description, she tells how she helped grow the club from 4 to 20 members, ran several charity projects through the club that raised over Rs.5,000 for art programs for local NGO run school, and arranged an informational event to help raise awareness of the importance of art in people’s lives. Which student do you think is most likely to be admitted? As it turns out, what you do is not nearly as important as why and how you are doing it. Extracurricular activities of all kinds can help a student to show off their best qualifications. Almost anything that you are actively and productively involved in can be considered an extracurricular activity. It is also ok if you do just one or two activities but then ensure that you do it in depth. A prospective student who participates in community activities will likely get the attention of a college admissions officer. A student who joins a group that fixes up the homes of destitute senior citizens with very few resources is working for the betterment of their community. A student who organizes a group of citizens to clean up litter along a local road is also showing great community spirit. College admissions officers like to see students who take initiative to organize or participate in activities that benefit their own communities. This shows responsibility and a concern for the welfare of others. Many college students list the sports teams that they are involved with on their applications for college. Extracurricular activities such as sports demonstrate a student’s ability to work with other people toward a common goal. This quality can help a student to successfully work with others on projects and assignments in college classes. Also, if the student’s team won a particular championship or achieved a great honor, the admissions officer takes note of the person’s dedication to the team. At PPRO EED, we frequently hear this question: “Are extracurricular activities important for college?” Our answer is always yes! An admissions officer is able to get a better picture of a person’s character by reading about their achievements and extracurricular activities. Our professional college admissions consultants can evaluate all of a student’s qualifications, including their extracurricular to see if it is adequate for acceptance into college. If a student does need to boost their profile, we can help a student to achieve that goal! Our experts have the knowledge and expertise to help students craft an impressive college application.